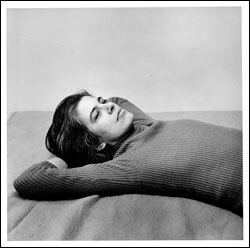 "All photographs are memento mori," Susan Sontag wrote in On Photography (1977), her groundbreaking collection of essays. So one could hardly imagine a more fitting memorial to the writer, who died two years ago, than this show of photographs organized around her reflections. In that book, Sontag pinpointed the moment when she lost something akin to her critical virginity, at age 12, while looking at "photographs of Bergen-Belsen and Dachau which I came across by chance in a bookstore in Santa Monica in July 1945. Nothing I have seen—in photographs or in real life—ever cut me as sharply, deeply, instantaneously…I felt irrevocably grieved, wounded, but part of my feelings started to tighten; something went dead; something is still crying...."